The Internet of Things is set to drastically change the face of banking business and provides numerous benefits for the relationship between lenders and borrowers. IoT-based elements could offer flexibility in the structuring of the loan amount, the interest rate or the terms of the borrower’s obligations under the relevant financing agreement so that it would effectively breathe according to the borrower's business needs. Monitoring information, covenants and events of default under loan agreements more effectively would allow lenders to manage their credit risks better. An automated transmission of information from borrowers to lenders reduces the processing time and administrative work. This would enable lenders a continuous check of borrowers’ compliance with their obligations and to use (smart) contractual measures to sanction breaches as early as possible. The IoT facilitates also the management of the collateral. Loan collateral and, as a result, also credit risks could be evaluated virtually in real time on the basis of notifications on the condition of the assets sent by IoT devices. Therefore, IoT data could also be used to trigger obligations on the borrower to provide additional collateral. In addition, in the event of excessive use of the collateral assets, a notification of the collateral provider through the IoT or even the use of shutdown devices could be agreed. Moreover, the enforcement of collateral could be prepared and initiated through the IoT. Finally, IoT features used for loan collateralisation may be deactivated after a release of the collateral and – in the event of overcollateralisation of the lender – parts of the collateral may be released with the help of the IoT automatically. the use of IoT could also subject implementation to technical disruptions, errors and manipulation. A conceivable solution could be appropriate contractual provisions which help to minimise these risks. 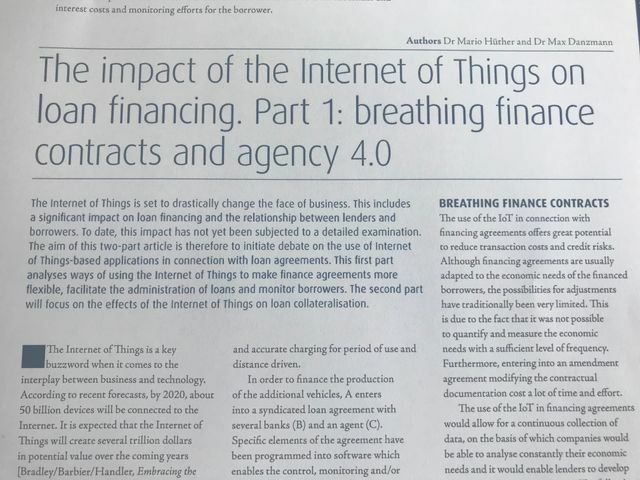 The use of the IoT in connection with financing agreements offers great potential to reduce transaction costs and credit risks. Whether lenders will ultimately pass these cost savings on to borrowers in the form of lower interest rates or lower agency fees will depend on negotiating positions in each individual case. "The Internet of Things is set to drastically change the face of banking business"